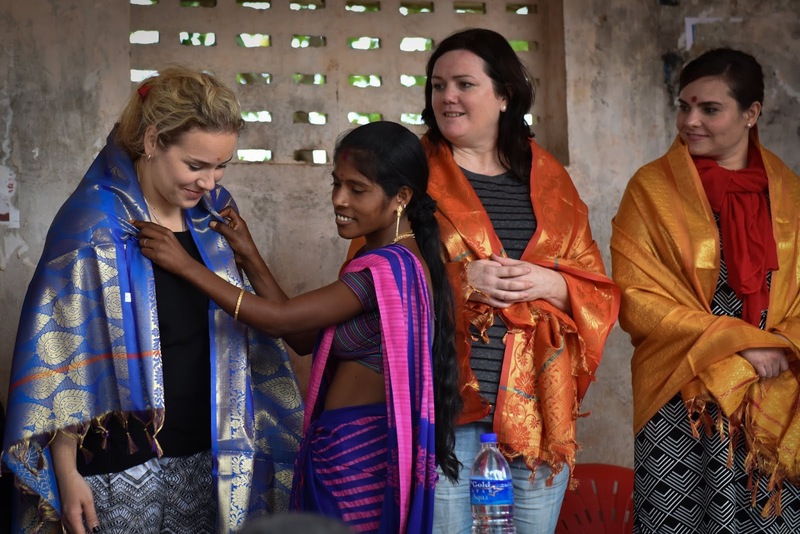 Dear Kids, before I came to India and saw first hand the work that World Vision is doing to impact lives and empower people and communities, I didn't actually realise that they were involved in so much. I knew about certain aspects of their programs, such as helping provide clean water, food and assisting children to get an education, but I didn't know that in each and every area that World Vision have a presence, issues are assessed and programs are developed, based entirely on the exact needs of the children and community. The first half of my journey was in a rural area, where I've already shown you a colourful little school and it's Nutrition Garden, that is the pride and joy of the village. Children there now have access to clean, fresh drinking water and they also have enough water now to grow their garden. But what other types of projects are World Vision implementing in this area? Here, in this village of around 120 families, World Vision asked the children and families of the sponsor children, what issue was effecting them the most, and were told that they wanted their fathers and husbands to stop drinking alcohol. Many had started drinking when they were young labourers and were addicted. Instead of providing for their families, they would spend the money on alcohol instead. Whole families got up and took it in turns to tell us about the impact that alcohol addiction had on them and told tales of hiding money, domestic violence, fear, going hungry and poor health. A young girl (who is a sponsor child) bravely told us of life before World Vision helped her dad, and her happiness that they now have food to eat and can feel safe in their own homes, thanks to the Rehabilitation program that World Vision convinced her father to be part of. Their stories, whilst confronting at the start to listen to, were filled with joy and hope as they spoke of their victories and how long they'd been sober and just how much things had changed. The thing that really stuck me though, was that unlike many people battling addiction, these individuals were doing it together as a community, and were supporting one another and making themselves accountable. And slowly, but surely, word spreads and more people who have seen these men turn around their lives for their families, approach World Vision to ask to help them fight this illness as well. 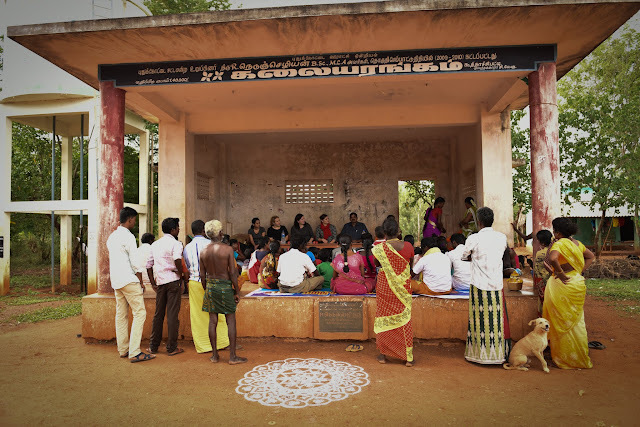 So far 35 addicts from various villages, including 10 from this village, have successfully completed the treatment (which includes travelling a long distance away for a 10 day de-addiction program, followed up by medicine and visits from World Vision workers). There's obviously a lot more that goes into it, from applying, to being able to show commitment, to partial loans and so on, but what you need to know, is that change is happening, it's oh, so positive, and it's all for the better of the children. These beautiful people, who survive on around $10 a day, just LOVE World Vision and what they have done for their families. It was so evident. They insisted on presenting us with beautiful shawls and expensive fruit that they had pooled together and purchased. It was truly humbling. And then, for something completely different, in this village we got to visit the Children's Parliament that World Vision set up. These children were taught about politics and saving and record keeping and democracy. It was just incredible! The Children's Parliament was started to develop leadership skills amongst the children community and the children take on different responsibilities (ie. President, Health Minister, Secretary, Treasurer, etc. ), discuss various issues relating to them and their village and try to find a solution together. They were pretty excited to see us. At their last weekly meeting, guess what the topic of conversation was about? Yep, Us! They decided that for our visit they would demonstrate how they hold their meetings and organised to put on a cultural dance show for us. It was just brilliant! You can see a little video I shared of them dancing here. 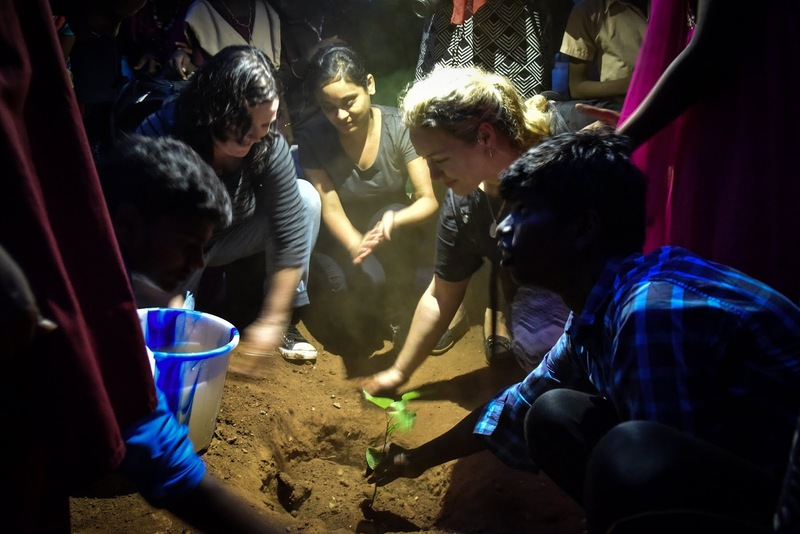 They also decided that we would help them to plant some trees. I'll think about these children and those little trees often and wonder how they are all flourishing. One of the funniest parts of this visit was when I tried to ask them if there were any adults that now attended their meetings. After my question was translated they laughed and I was told, "It's called a Children's Parliament for a reason." Well, duh! haha. Too funny. These children are empowered. They have hopes, they have skills, they have dreams, and unlike generations before them, they believe that they can do it. That they can reach for the stars and achieve. I believe they can do it too. Then, from the older kids to the younger. Here, World Vision help support these government run Naganwadis (child care centres for 2-5 year olds) through training for the teachers. 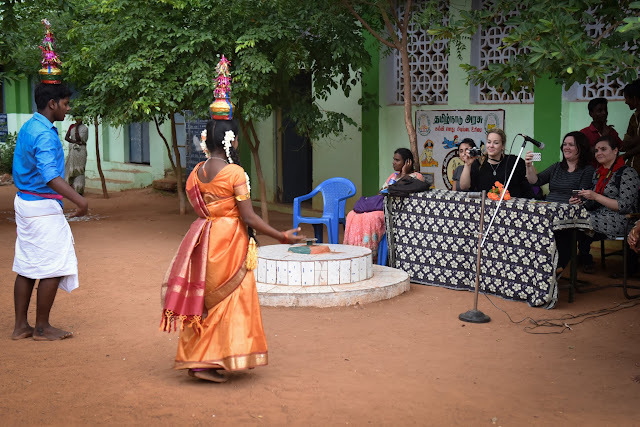 They are taught things like, how they can best care for the children, including providing the children with a nourishing meal while they are there, as well as curriculum materials like songs and rhymes to teach the children. They also paint murals, not only to make them more welcoming spaces for kids, but to help them learn, as well as providing toys that the children can play with. We spoke with some of the mothers of the children and they are very happy that their children have somewhere safe to go so that they may work or look after siblings, and especially that they know their kids are being monitored for health and growth, provided with adequate nutrition and are being given a head start in education. From childcare we move to toilets, which is something quite new to this area. Generally people here just have to do their business out in the open. Not only is this not sanitary, but it is not safe (girls have to always take someone with them for safety, which logistically, you can imagine would be frustrating). It is also often embarrassing if they have visitors come to stay from out of town, we were told by one of the locals. Here World Vision are helping to introduce toilets to houses, starting with 15 families of sponsor children, by joining with the government in providing materials for them to build their own bio toilets and educating the communities on how to keep them maintained. Now these families are using the toilets as a model to others in the village. Lastly from this area, we saw this fabulous Milk Society. This village had a high rate of malnutrition, due to inadequate food and poverty, so in order to reduce this, World Vision gave economic development assistance, in the form of cows (of which the villagers must save money from their earnings and pay back 20% of the cost of the cow), and education (such as the importance of saving money, how to grow wealth, etc.) so that they could start to turn things around. During this joyful visit, we were told by one of the villagers of how they'd turned one cow into six, by selling the milk and saving money to buy more cows. Over time, the rate of malnutrition in this village has decreased dramatically, as not only do they now have good milk to drink, not watered down milk like before, but the families are able to be self sufficient so they have enough to provide adequate food for their children. Once again, the community works together to support one another and like other projects we saw, the women always speak of their children as their biggest motivation and their desire to provide a life for them that was different to their own. And the smiles. If they could invest in beautiful smiles, they'd be millionaires. That's a lot of different projects going on in this rural part of South India, and we've only just had a glimpse of some. Dear kids, can you believe that there are so many different things that World Vision are involved in? That help is being given where it needs it most, but not as charity, not as a handout, but by facilitating empowerment? The people in these stories have hope, dreams, health, dignity and happiness, and these are just a few examples. There is so much more but they will have to wait for another day. If you missed them, here is Part 1, and Part 2. You can also follow along with our adventures over on Instagram, under the tag #wvaindia and #wvabloggers. I’m here in India with fellow bloggers, Kelly from Be a Fun Mum and Alison from Talking Frankly. Check out their sites for even more of the story.